Embrace the Majesty, the Magnificence of Venice. Venice. Floating like a mirage on a sparkling lagoon, Italy’s famed city overflows with romance of a bygone era. Everything bears the stamp of a rich artistic and cultural heritage. And everywhere, sheer beauty colors the Venetian way of life. Mazes of cobblestone calli lead to opulent palazzi and festive piazzas. Historical buildings, with their gilded statues and massive columns, lower their front steps into the gently lapping waters. And along II Grande Canal, straddled by picturesque bridges, graceful gondole glide by. From this exquisite landscape, The Venice takes shape. 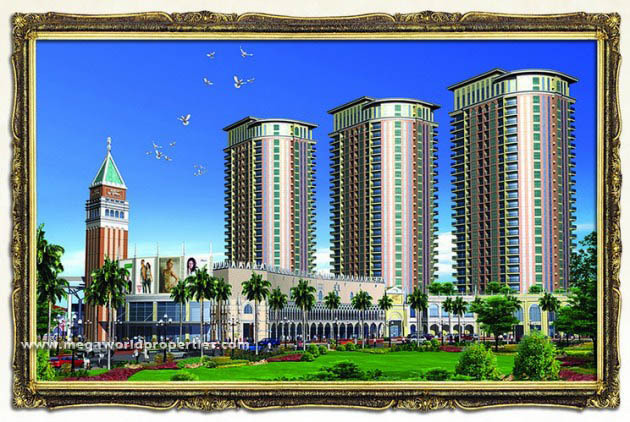 An extraordinary address in McKinley Hill that captures the glory and grandeur of Venice. As the newest community in the McKinley Hill township in Fort Bonifacio in Taguig City. The Venice enjoys a location of a great advantage. Here, it’s easy to go from your sheltered haven straight to key places in he township and Metro Manila. Stroll to work at the McKinley Hill Cyberpark, right outside your doorstep. And arrivre at nearby international schools, embassies and an events pavilion just as quickly. The offices, learning centers and malls in Global City and Makati are easily reached through Upper McKinley Road.